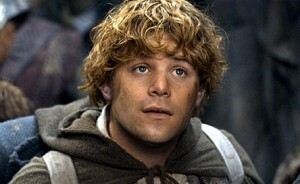 Most people think Frodo is the true hero of The Lord of the Rings. To put it another way: It is accepted by nearly all readers that the novel is about Frodo. It’s his quest, his burden, he’s the focus. The little blurbs in magazines that are designed for the non-initiate read like this: “The story of a hobbit, Frodo Baggins, who is sent to destroy an evil Ring of power…” Sound like a good pitch? Not quite. 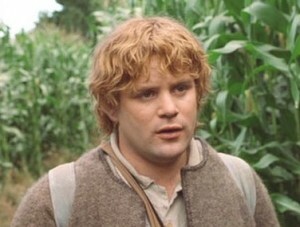 The main character is really Samwise Gamgee, though you may not know it. I’m telling you now, it’s all about Sam. 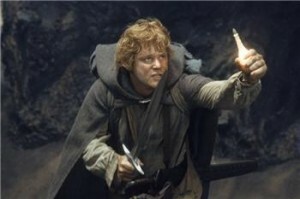 You can safely argue Frodo Baggins should be the centerpoint of the tale. In The Hobbit Bilbo had the limelight for an entire book, and no one came close to grandstanding him (except maybe Smaug). Seems like Tolkien intended to chronicle the history of the Baggins family; first through Bilbo’s adventures–then with Frodo inheriting more adventures than he bargained for. The story takes Frodo’s point of view often enough. Throughout the trilogy we share his experiences though personal sensations, his internal thoughts, and even his dreams. Tolkien lets us inside his suffering. And through that suffering we understand the dynamic of true sacrifice. He’s the Ringbearer, after all. But a character-driven story like LOTR is not strictly about sacrifice (or heroism, or the impermanence of beauty, or all those themes that are intrinsic). I must admit the novel is woven of many threads but the groundwork of the tale, the telling of it, spins on a single proviso: Who is transformed the most between the opening and the closing page, taking the reader through his transformation? Aragorn is the most heroic character. But it’s not his story. Gandalf is greatest manipulator of events. But it’s not his story. Sauron is the ever-present antagonist. But it’s not his story. Let me give you the clearest example from another fantasy, familiar to all but the most sheltered–Star Wars. You think the original Star Wars films are about some farmboy named Luke Skywalker? You think he’s the main character? BUZZZ! I’m so sorry… thanks for playing! If you had said Darth Vader, you’d be walking home with the grand prize. The guy in the black helmet is pulling all the strings. 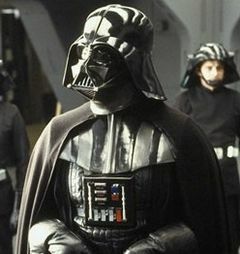 Vader begins the first scene of the first episode by walking through that laser-blasted door looking for Leia. He is the first character the audience has a relationship with. More importantly, his choices put the plot in motion for all three films. Every facet of the story we experience is an after-effect of what Darth Vader is doing. When Return of the Jedi comes to its conclusion, it is only after Vader’s most difficult redemption and after we see his glowing form with his predecessors, that we know the story is over. He’s redeemed. Roll credits. The end. When you write a 1,200-page novel, you have the luxury of branching off into other subplots and you can take time to work with various characters. But you still need one common thread that thematically brings your story full circle. The transformation of Sam is Tolkien’s central storytelling device, though not the most obvious one. There are many clues that reveal Sam, not Frodo, as the main element. Crazy about stories of the old days he is, and he listens to all Mr. Bilbo’s tales… Elves and Dragons! I says to him. Cabbages and potatoes are better for me and you. So you see, our dear Sam is the contact point that we immediately relate to. Just like him, we are daydreaming of fairies, elves, and elephants. That is why Tolkien introduces Sam at once. All the magnificent events of the War of the Ring, the journey, battles, treachery and triumph, are diluted down to this profound effect: Sam is transformed beyond what he recognizes in himself. In the end he becomes the subject of all his dreams. Even he acknowledges that his feats might someday be the subject of future stories and songs. To this Sam replies, ‘…Still, I wonder if we shall ever be put into songs or tales.’ And with that strangely self-referential remark, the Professor quietly moves Sam into his greatest moments of peril and deliverance. As final proof, I offer a closer look at the novel’s conclusion. The epic story does not end with the destruction of the Ring, not even with Frodo’s departure from the Grey Havens. The final moment we cling to as the story closes its doors, is of Sam coming back to his family, sitting at his table and declaring that his role in the formation of a myth is done. Three simple words, “Well, I’m back,” are his final admission that there is no more story for him to contribute to. Sam’s perspective is that he can finally return to domestic life without any further adventures. An end has come to chronicling his tale. He is now back with his family, back to his private life; and the intrusive eyes of future generations can leave him in peace. This article was first published on March 1st 2001 in Green Books. In an effort to introduce new Tolkien fans to our nearly 14 years of archived content, we will be publishing articles like this on a regular basis. We hope you enjoy it!